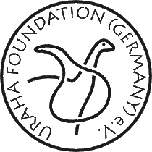 From Space to model – URAHA Foundation Germany e.V. monitor solar radiation, the atmosphere, the oceans and continents from a single space-based platform. Terra provides measurements of the global/seasonal distribution of global bioproductivity (land and oceans); land use; land cover, snow and ice; 24-hour global surface temperature; clouds; radiative energy fluxes; aerosol properties and water vapor, fire occurrence, and trace gas levels. One of the most important on board instruments is the Advanced Spaceborne Thermal Emission and Reflection Radiometer (ASTER). It is the highest spatial resolution instrument on the satellite (15 to 90 square meters) providing images of the Earth in the visible, near-infrared, shortwave-infrared and thermal infrared regions of the electromagnetic spectrum. Due primarily to the high resolution, ASTER is the only Terra instrument that does not acquire data continuously. Scientists can change the data collection configuration from Earth depending upon what their needs are, however, the routine data collection is only 8 minutes each orbit! 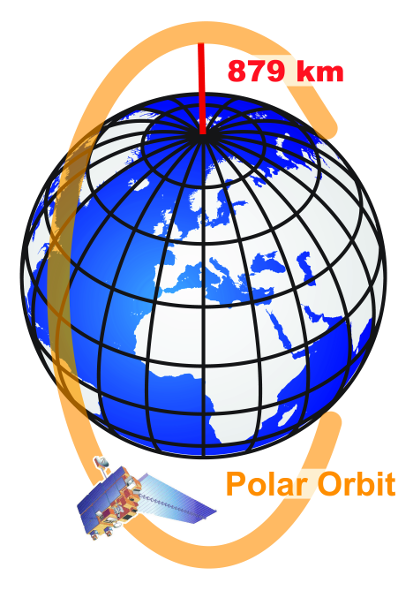 The polar orbit is just under two hours. The satellite is big as a small bus but it moves with 26650 km/h. 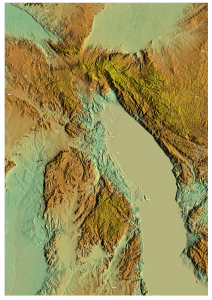 The Digital Elevation Model (DEM) from the ASTER instrument is represented as a digital raster (a grid of squares, also known as a heightmap when representing elevation) without further definitions about the surface. The data is also freely available for 99% of the globe, and represents elevation at a 30 meter resolution. From these dataset is possible to interpolate a digital contour map which is a good representation of relief . A contour line joins points of equal elevation above a given level, such as mean sea level. On maps the contour lines shows valleys and hills and the steepness of slopes. More generally, a contour lines are curved or straight lines on a map describing the intersection of a real or hypothetical surface with one or more horizontal planes. The physical wooden model shows us these horizontal planes from Malawi sealevel up to 2800 m NN in mountain areas. From these model based on contours, a sense of the general terrain can be determined. To get more information about geology in the model rock units or geological strata are shown by color to indicate where they are exposed at the surface. The original geologic data was derived by the geological maps from the Geological Survey of Malawi, the Geological Survey Department of Zambia and the Geological Survey Department of Tanganyika.